Our Store has been selling, repairing, and estimating pianos since 1957! Schroeder requests your answers to the following questions in order to make you a cash offer or to consign and or list your piano for sale. You can also receive an Online Estimate of the value of your Piano by email based on your answers to these questions. 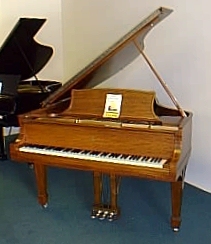 The estimate is FREE if you are selling a Steinway, Mason & Hamlin, Yamaha and other selected brands. Your estimate fee will be refunded and is also Free if we buy or bring your piano to Schroeder's for consignment or non-profit donation. Please fill out the following form as thoroughly as possible and click the submit button at the bottom of the page. You must include your e-mail address and phone number. We will contact you with payment options and provide personal assistance. Submission of digital pictures results in more accurate appraisals and cash offers! They may be easily attached near the bottom of the form directly from your hard drive. 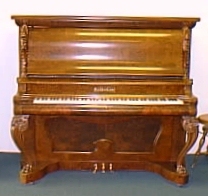 In what country was the piano manufactured? In what city was the piano manufactured? What is the piano's Model? (Serial numbers are usually just numbers. Some are a single letter and a number. Have you increased the value of your piano? on each applicable item on this list. and what year the work was done. Please include other changes as well. Pianos come in different sizes. To be accurate, they need to be measured. How ornate is you piano? Please describe the style of your piano. What is the shape of the piano's legs.? Hold "Ctl & Click" one item for cross-section shape and one item for leg profile. Select one or more purposes. Hold Ctl, & Click. If want to sell and have a price in mind please enter it here. If you selected 'want to list the piano on Schroeder's piano list', we need to know the least that you would accept at this point for the piano. Would you like to know why the purpose of the estimate changes the value of your piano? Please quickly look at the following questions and click the appropriate radio buttons. Does your piano have loose tuning pins? Does your piano have broken strings? Does your piano have cracks in the sound board? Does your piano have loose ribs? Does your piano have broken or missing parts? Does your piano have loose veneer? Does your piano have sticky or stuck notes? Does your piano have water damage? Does your piano have fire or smoke damage? Please type description of problem here if you clicked yes to any question. or, if not, all file types can be selected from a pull down menu. For information on the twelve picture system click here. JPEG or JPG files are recommended. this is the same piano? another piano?